Study Medical Photos: A 16-year-old girl who just returned from a camping trip reports an intensely pruritic vesicular rash. A 16-year-old girl who just returned from a camping trip reports an intensely pruritic vesicular rash. Poison ivy or poison oak is also referred to as Rhus dermatitis. 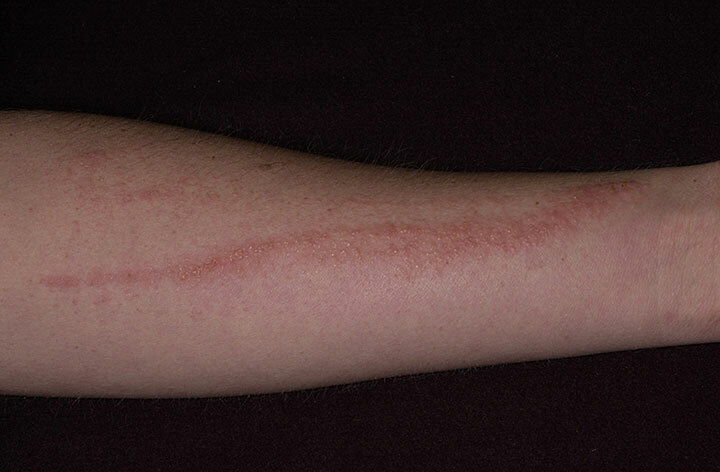 The condition is associated with intensely pruritic linear streaks of vesicles, papules, and blisters. The plants contain a resinous oil that gives rise to an allergic response approximately 2 days after exposure. Contrary to common belief, the fluid in the blisters can neither transfer the rash to others nor cause it to spread. 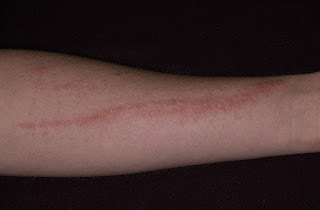 Treatment involves topical steroid creams, Burow’s solution, calamine lotion, antihistamines, cool baths with colloidal oatmeal, and oral steroids (for 2 to 3 weeks to prevent rebound dermatitis) for more widespread cases.